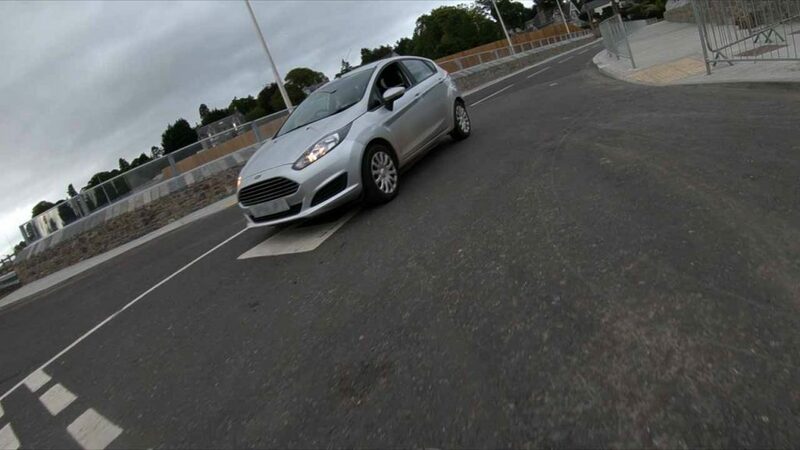 A new ring road has been built around Aberdeen without any provision for cyclists and one particular intersection is now more treacherous for cyclists than it was before. People using the Deeside Way must navigate a dangerous intersection to cross the B979 to rejoin the pathway. The problem is due to a missing pavement which hasn’t been completed and it’s not clear whose responsibility it is to complete. The Deeside Way is an old converted train line which is completely traffic-free and popular with cyclists, walkers, joggers, and even horses. 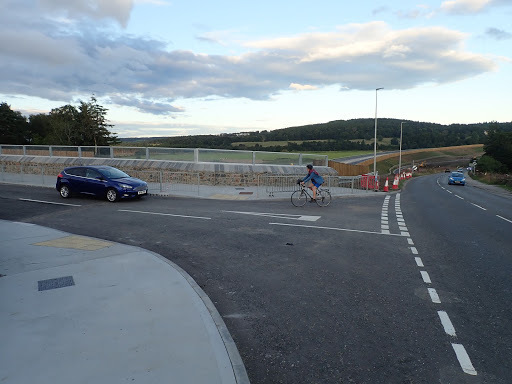 The AWPR goes straight past the Deeside cycleway and could have provided a fast and direct route for cyclists to get to the airport and beaches to the north of Aberdeen, had they included a segregated cycleway in the design. Instead cyclists will be banned from using the road. Ironically, an event has been planned for the weekend of September 8 and 9 for cyclists and pedestrians to celebrate, among other things, active travel. The people of Aberdeen and Aberdeenshire think it’s unacceptable in the 21st Century for new roads to completely ignore the needs of cyclists and other modes of active travel. The cyclists and pedestrians of Aberdeen and Aberdeenshire are gathering for a demonstration outside Marischal College on Sunday 9th September at 12 noon to demand better provision for active travel. A lot of money has been spent building the new AWPR but cyclists were not considered in the design and its construction has made conditions worse for cyclists. The fencing and lack of a pavement mean that cyclists and pedestrians are forced to perform this dangerous manoeuvre if they want to use the Deeside way. We want all road projects – including new builds and maintenance works – to incorporate active travel in the design phase. If you want to join Rachel and the Aberdeen Cycle Forum you can sign up to the Facebook event here – and if you want to take things further Aberdeen Cycle Forum are jointly hosting a Walk Cycle Vote Campaigners’ Day in Aberdeen at the end of the month.